This Fool loves companies that can make money and pay dividends even when times are bad. I'm a huge fan of dividends, but that's not the only thing an investor should be looking at. U.S. steel giant Nucor (NYSE:NUE) and global industrial powerhouse Eaton Corp. (NYSE:ETN) both possess traits that make them stand out beyond just their dividends, and I plan on never selling either. Let me explain why. Nucor is one of the largest steel companies in the United States, with among the most diverse product portfolios in the industry and a focus on higher-margin specialty fare. It also makes use of some of the most modern steelmaking techniques, based on its electric arc furnace core. These types of furnaces are more flexible than older technology, allowing Nucor to (simplistically speaking) turn its steel facilities on and off quickly and at relatively low cost. These are a couple of the reasons why the steel giant has EBITDA margins that are always near the top of its peer group. (That isn't to suggest it's always at the top, because it isn't. But it is always among the best performers.) Another reason for the EBITDA strength is a unique pay structure, which includes a significant profit-sharing component. Basically, the company rewards employees during the good times, but asks them to share in the pain during bad times. That provides a relief valve on the cost side that protects margins exactly when Nucor needs it most without the need for restructuring and layoffs. NUE EBITDA Margin (TTM) data by YCharts. The end result is a company that has simply done better than competitors during what has been a long and painful steel industry downturn. While Nucor posted a net loss in 2009 like the rest, it has remained profitable since. No other major steel company can claim that level of success. And then you can add in the not-so-minor fact that Nucor has increased its dividend every year for more than 40 years. The increases have been modest lately, but that makes sense given the industry downturn. However, I'm willing to forgive that to get a well-run business that has proven its strength through trying times. 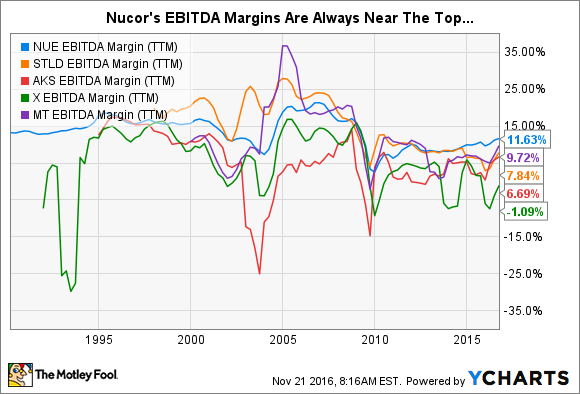 With a 2.5% or so dividend yield, Nucor isn't cheap today, but it is worth keeping on your wish list in case it sells off. Eaton's story isn't quite as exciting as Nucor's tale. Eaton is an industrial giant that focuses on power management, with key operations in electrical (around 60% of sales), auto (16%), aerospace (about 9%), and hydraulics (a touch over 10%). Power management is an increasingly important aspect of the industrial world. Although the company's products can get pretty complex, Eaton's late 2015 purchase of Ephesus, which makes LED lighting for sports stadiums, gives a broad idea of the industrial giant's focus on using power more efficiently. But, like Nucor, Eaton is facing hard times today. For example, the company expects organic sales to decline 4% this year. That's not unique in the industry; Eaton's competitors are pretty much feeling a similar pinch. Despite this headwind, however, Eaton is expecting to earn between $4.15 and $4.25 a share this year. That's roughly in line with what it earned in 2015. The company's cost-cutting efforts are a key reason for this relatively solid showing in the face of adversity. ETN Dividend data by YCharts. There's two takeaways here. First, Eaton is facing some growth headwinds but it's still very profitable. For example, the company expects net operating margins for 2016 to be roughly inline with those of 2015, despite weakness in its end markets. Which brings up point number two, Eaton has a long history of managing its businesses via costs cutting, asset sales, and acquisitions with an eye toward maintaining its profitability and supporting long-term growth. That portfolio level view is one of the key reasons I like Eaton. Eaton started over 100 years ago as a supplier to the auto industry. It has shifted and adjusted through the years to create a portfolio that best meets the needs of its customers at any given time. Change is a constant and something that this company has learned to manage well. I'm confident based on its financial results and corporate history that it will handle just about anything the market throws at it. Add in a dividend that has historically been increased steadily, though not annually, and this long-term survivor starts to look pretty alluring. The 3.5% or so yield offered today isn't bad, either, though the shares aren't as cheap as they were in early 2016. Still, I'm not selling anytime soon. If you're in the market for a decent yield, Eaton is worth a deeper dive. 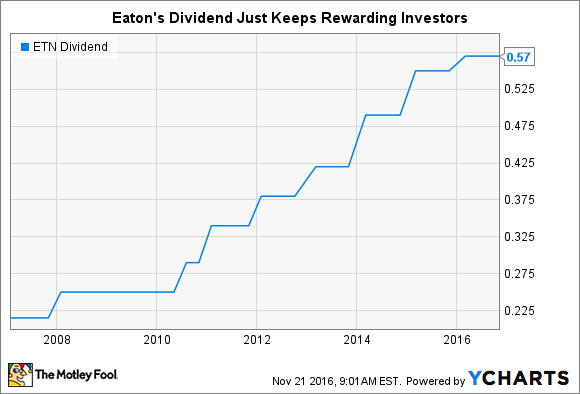 At the end of the day, dividends are one of the big reasons why I like Eaton and Nucor. But there's so much more behind that, with a notable focus on the corporate culture behind each business and the ability these companies have shown to succeed in the face of adversity. If that sounds good to you, take a look at Eaton right now and make sure to put Nucor on your watch list for later.